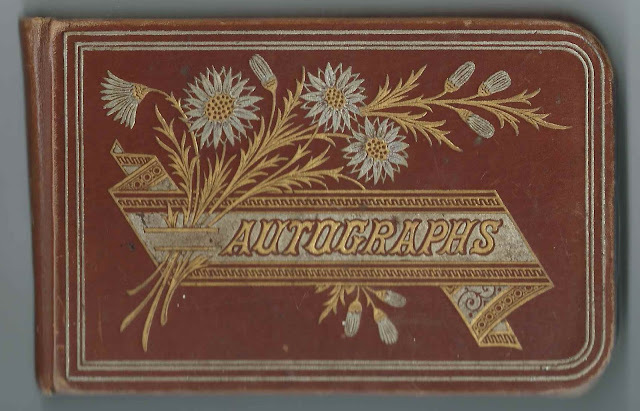 1880-1910 autograph album kept by Clara Ann Kegg of Little Shasta, California, before and after her marriage to August Janson. On a page inscribed by Clara herself, she indicated that the album was a Christmas present in 1880. Clara added the names of future spouses to the pages of many inscribers; refer to the list of inscribers at the end of this post. As you can see from the page at left in the above image, two pages were inscribed in 1879, but these are pasted in the album, apparently from a previous album or from individual notes to Clara. The W. Crow who inscribed the left page was apparently related to Clara's mother, Susannah (Crow) Kegg. The album measures approximately 5-1/4" by 3-1/4" and contains the sentiments of 100 of Clara's relatives, friends and teacher. In a nice touch for family historians, Clara frequently added the names of people inscribers would marry, including some dates, information included in the list of inscribers at the end of this post. An alphabetical list of surnames and an alphabetical list of the inscribers, together with any personal information they offered, appear at the end of this post. Clara Ann Kegg was born about October 1868 in Siskiyou County, California, the daughter of John Kegg and Susannah (Crow) Kegg. Susannah inscribed a page in daughter Clara's album. Clara had several siblings, some of whom left their names in her album. One page contains Clara's autograph, written in 1890, and those of Don Keg; Clay Keg; and Fred Kegg; as well as that of Cornelia Soule, who left her message in 1884. Clara's teacher, W. H. Laird, inscribed the facing page. Siblings ClayKegg; Ella Kegg; Emma Kegg; Fred Kegg; and Meta Kegg inscribed individual pages. William Dow Simcox, son of Clara's sister Cecilia, inscribed a page in 1894. About 1891, Clara Ann Kegg married August Janson, son of John and Josephine Janson. Clara and August lived at Table Rock, California, and had, I believe, four children, two of whom died young. August died in 1939 and Clara in 1947; they're buried in the Little Shasta Cemetery at Montague, California. If you have corrections and/or additions to the information, or information on any of the inscribers listed below, please leave a comment or contact me directly. Note: The e in the surname Soule is accented. A. L. Barnum, inscribed on January 26, 1881 at Table Rock, California, in Siskiyou County. Addie Casedy, inscribed on February 8, 1882. A later note by Clara indicates Addie married Mr. Hinross [perhaps she heard the name incorrectly]. A funeral home record shows that an Adelaide (1861-1940), daughter of Daniel Cassidy, was the wife of William Henderson Kinross. Mrs. Almary Cash, inscribed on January 29, 1882 at Mount Shasta, California. She was Almary (Gates) Cash, wife of Nelson Cash. John Cash ?, possibly John Cash, Junior, or John Cash Jones or John Cash ? Emma Davis, inscribed on January 25, 1881. A later note by Clara indicates that she married C. Kennedy on December 8, 1891. I believe the groom was Clarence Bolton Kennedy. Hattie Davis, inscribed on February 15, 1881 at Mount Shasta, California. Clara left a later note: "married Jim Williams". Mary B. Davis, inscribed at Mount Shasta, California, on December 1, 1885. She was Mary (Buehrle) Davis, wife of Jesse Francis Davis. Mr. and Mrs. Jesse Davis; their calling card pasted on the page. They were Jesse Francis Davis and wife Mary (Buehrle) Davis. Mary inscribed the left facing page. Jennie Deter, inscribed on March 21, 1881. Clara's later note: "Married Mar. 23, 1880". Clara Ann Kegg of Little Shasta, California, album owner; she inscribed a page on December 25, 1880 and noted that the album was a Christmas present. Clara wrote her name in 1890 on a page shared with Cornelia Soule, Don Kegg, Clay Kegg and Fred Kegg. Emma, "Your Sister", inscribed at Mount Shasta, California, on December 25, 1880, the day Clara received her album as a Christmas gift. Clara's older sister Emma Kegg. Fred Kegg, inscribed at Mount Shasta, California, on March 2, 1888 and also shared a page with Cornelia Soule; album owner Clara Kegg; Don Kegg; and Clay Kegg. Fred was album owner Clara Ann Kegg's younger brother. W. H. Laird, "Your Teacher"
A. J. Lowderbaugh, inscribed on January 24, 1881; presumably Alice J. Lowderbaugh, who married inscriber Harvey Sarter; she inscribed another page as well. M. M., inscribed on February 22, 1881. Clara later completed the surname initial to indicate Martin. Perhaps Milton Martin? Annie MorningStar, inscribed at Mount Shasta, California, on June 13, 1882. Clara's note: "Married John Kegg". Annie Morningstar became the second wife of Clara's father John Kegg. William D. Simcox, "Your Nephew", inscribed on February 22, 1894. He was William Dow Simcox, son of Joel Thomas Simcox and Cecilia Jane (Kegg) Simcox. Damia Soule, inscribed on 4-12/84 at Mount Shasta, California. Clara left a note: Married Alfred Spurr June 11th 1890". They moved to Massachusetts. Estella Soule, inscribed at Mt. Shasta, California, in April 1884. Clara later wrote "Hooper". Estella married Frank W. Hooper about 1890, according to the 1900 Census. Etta Soule, inscribed at Mount Shasta, California, on August 27, 1882. Later note from Clara: "Married Davis Earhart". Presumably Esther Lavina Soule, who reportedly married Davis Carlisle Earhart on November 13, 1889 at Mount Shasta, California, though I haven't found a record of that. Carrie Swan, inscribed at Yreka, California, on March 5, 1883. Clara's later note: "Married Wm Larison". Will contact you via email. Glad you happened upon this post! You'll find my email address under Inquiries in the right margin near the top. I'd be happy to email you the images, my treat!